Welcome back to Measure9 blog. Here I continue with article series “Setting up Magento development environment, step by step“. Please read Part 1, too. In this post I’m going to shed some light to surrounding processes and most low level tools. So we go from general to more specific with each subsequent article in this series. 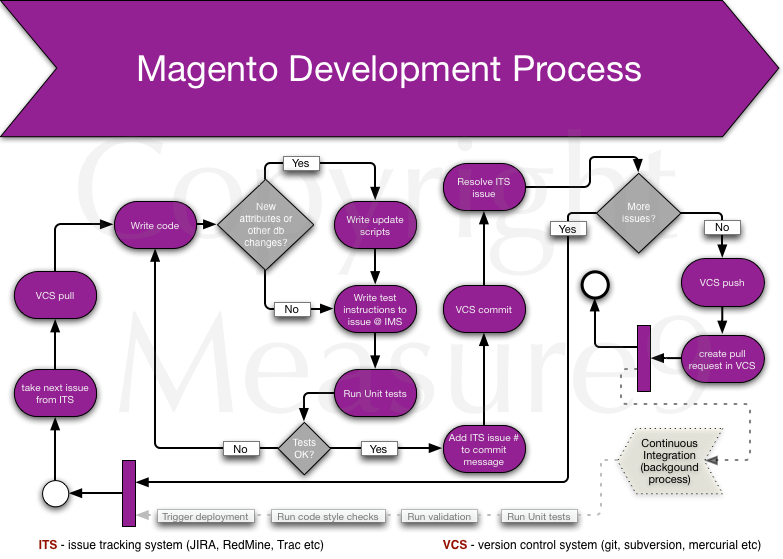 A quite generic Magento Development Process looks like that. It involves an Issue Tracking System (ITS) and Version Control System (VCS). Also unit testing is in place. If you’re really after quality and fun in development then I do recommend to set up Continuous Integration solution. There is quite a number of solution like Bamboo, Jenkins and others. Version control is something that should be in place even if you’re working alone. It helps you to keep your work organised, establish good working habits and integrate your work thru various environments and phases of a project’s lifecycle. See more from Wikipedia. The first 3 are quite modern while CVS is an old dinosaur and ClearCase is a proprietary yet very powerful and integrated system by IBM. Anyway, my gut feeling says that GIT is most widely used nowadays and there are reasons for that. When you start a project you do git clone (1). This gives you working folder with all project’s files. You do it once. Then, every day after your morning coffee you do git pull (2). Git pull gives you updates that have been pushed to upstream by other developers. After that you do git branch (3) if you haven’t done it already. This gives you isolated branch where you can mess around with the code any way you want. There is a number of branching strategies around, you need to choose what suits you best. There’s also a good example of a successful git branching model. Now you’re working with the code and you do git commit (4) (save code version to git). It’s recommended to keep commits small, I’d say atomic. Minimum one commit per fix or per issue from the ITS or per file. You’ll see that it’s good to keep commits small because when they day of rollback comes (and it will!) then you’d be grateful you did small commits that can be rolled back one by one. Then you feel that you’re ready to share your work with others. So you do git pull (5) again to retrieve latest changes from the remote and master branch. Then you merge (6) master branch into your named branch and if it’s cool (no merging errors) you’ll merge your changes back to master. Then you do git push (7) and share your work with others. Some day (when I have time) I’ll add command line examples here, too. OSX and Linux are both good choices for Magento (or any web) development. For OSX there’s excellent package manager homebrew that gives you all necessary tools if you’re not satisfied with already built-in Apache web server and somewhat oldish PHP 5.3. With Linux it’s simple – choose a distro that you like. My recommendation is Ubuntu or Debian. The both have APT package manager that satisfies all your needs. Installation and configuration of tools will be covered in future posts. One more thing is the terminal application. I think the the Linux’ defaults are good but there’s a better alternative for OSX’ Terminal.app and this is iTerm2. Install and use this one instead of native Terminal.app. It provides a few very good convenience functions like “copy when select” and similar.